We specialize in domestic european sewing machines and sergers. Euro Tech Sewing Machine Repair is a fully licensed service centre with a legacy of timely, quality service. Euro Tech provides service to the Lower Mainland and Sunshine Coast including Half Moon Bay, Sechelt, Gibsons, Pemberton, Whistler, Squamish, Bowen Island, West & North Vancouver, Vancouver, Burnaby, Richmond, White Rock, West End, and Maple Ridge, Coquitlam, Port Coquitlam, Surrey and Port Moody. Questions and inquiries are welcomed. Please feel free to call or email for quotes and estimates. Wei Hin Ng, owner and operator, was apprenticed in Brunei over two decades ago. Upon immigrating to Canada in 1989, Wei Hin join Albee’s Sewing Centre in North Vancouver. In May 2008 Albee’s closed giving Wei Hin impetus to strike out on his own. During the 19 years with Albee’s, Wei Hin has attended numerous factory-training sessions. In addition, he worked part-time for Elna Canada as a repair technician to further his knowledge and experience. 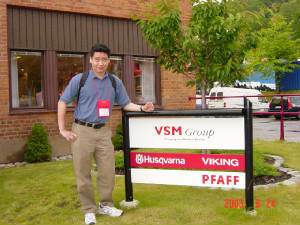 In 2003, Wei Hin traveled to Sweden to see first hand how Pfaff and Husqvarna sewing machines are manufactured. Wei Hin is certified with a number of manufacturers and is a reliable, hard working individual who maintains a high standard of professionalism and service. Customers are entirely satisfied with his work and efficiency – providing quick service to reduce down time. Our clientele include home makers, fashion designers, quilters, textile manufacturers, professional businesses and academic institutions.